EUR/USD surged to a 6-week high on the Fed’s dovish decision. Powell’s comments add fuel to the fire, pushing the pair even higher. The four-hour chart shows overbought conditions. The Fed took a decidedly dovish twist. The fresh forecasts for interest rates, aka the “dot plot” shows no rate hikes in 2019, a significant slashing in comparison to two hikes in the previous forecasts in December. Moreover, the reduction of the balance sheet ends in September 2019. These are some of the five dollar downers in the statement. That sent EUR/USD above 1.1400. That sent EUR/USD to near 1.1450. The decision by the US central bank is dovish and the greenback could even extend its falls if the yield curve inverts. An inversion, especially of the 10-year bonds vs. the three-month ones, implies an upcoming recession. However, the technicals point to a different direction. The Relative Strength Index on the four-hour chart is above 70, thus indicating clear overbought conditions. It is it enough to take a quick look at prices to see how limited moves turned into a sharp surge. Will we see a correction? The 50 Simple Moving Average is rising towards the 200 one. If the 50 crosses the 200, it is the “Golden Cross” pattern that indicates further gains. Nevertheless, the chart shows a greater chance of a correction before we see additional gains. 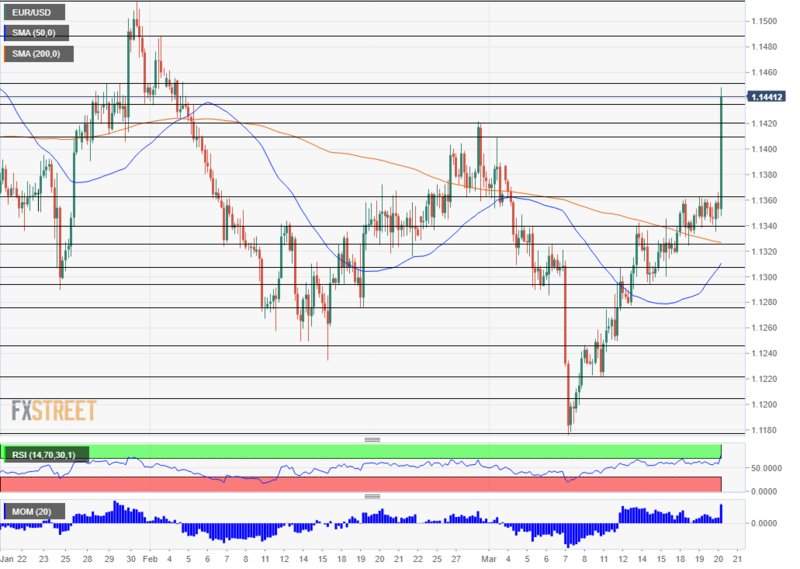 The next level to watch is close: 1.1450, where the pair stalled at the time of writing, is also the resistance line after capping the pair in January. Further above, 1.1485 was a swing high in early January. The ultimate resistance line is 1.1515, the high level was seen in late January. Looking down, the peaks of 1.1420 and 1.1410 seen around the end of February and the beginning of March are notable. 1.1360 which limited any gains in recent days is next.